“I like a challenge”. That would probably be the best way to explain why I have found myself doing Triathlons. That and the inevitable accusations of being in the grip of a perpetual mid-life crisis! Triathlon keeps me fit and helps me feel good about myself. It helps me understand the needs of athletes and the training methods to stay faster for longer. 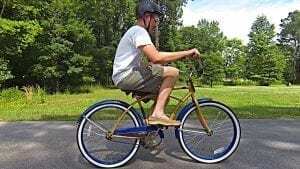 To be fair I’ve always liked cycling. Mainly mountain biking really as a kid and young adult. I used to be good at cross country at school, until I hit my late teens then got distracted by the bright lights and excitement of going out. Following a fairly significant car accident I started swimming to strengthen and rehabilitate my injured neck and upper body. Then I just decided it would be good to tie them all together and do a triathlon. A patient of mine talked me into it and so a motley crew, with me being the youngest, headed off to Mallorca for my first attempt. I had my heart set on sub 2hours 30mins for my first one. I finished in less than 30 mins! Lack of preparation and a complete failure to realise that I was in the company of some serious international athletes lead to me running into the fairly rough sea with the top boys who were all there for some pre season training. I’m not ashamed to say that I was swamped by what seemed like those scenes of wilderbeast crossing a crocodile infested river. Every time I tried to get a breath I was under again. Add in the espresso coffee, tight suit and rough seas and it rapidly went to disaster. Trying to breath a good part of the salty Mediteranean lead to my first and hopefully last ever panic attack type experience. I simply couldn’t breathe. A brief stop on a kayak followed and then on I went. Only to be offered a rescue from a rib. It was too tempting and I abandoned as I wasn’t going to get my time and all rational thought had gone when I couldn’t breath without coughing due to a mild bronchospasm. Not being allowed back in to get my kit from transition meant I had to stand in my revealing Triathlon suit in the middle of a foreign town. That was enough to make me think more carefully about how to achieve a better result. So having been told I had a talent by one of our fellow competitors ( before nearly drowning ) I thought I’d have to prove him and me right. The following year, with a little more training I started my Olympic triathlon events with a nice hilly one in the Purbecks at Swanage. I got off to a good start coming out of the water in around 23 minutes. Then I was off on my bike and managed to stay ahead of those following who didn’t have Time Trial bikes. Things were going well and I started the run in a good position. However…I hadn’t done enough running. After climbing the big hill at the Obelisk on Ballard Down and stretching out for the descent, Hamstring number one cramped. It was like being shot! A quick stretch from some passing walkers and I was off again…..for 20 yards, bang the other one went!!! Further stretching, lots of swearing and I was off again, albeit slower. People soon were passing and I couldn’t do a thing about it. The end result 2hours 32 minutes, Dammit!! A month later I got cramp at the second transition and that was after a fast bike where I lost my chain. I then tripped on my kevlar laces and bashed my knee. Bloodied but undeterred I hobbled round the course and finished in 2 hours 30mins and 11 seconds. Gutted. So next stop Portsmouth, flat course and closed roads helped me complete in 2 hours 27 and a few seconds. Not bad. Next stop half ironman, however Glandular Fever got me last year and I couldn’t compete at all. So now I have the big year of doing two half ironmans and the full monty in Mallorca, plus Portsmouth where I would like to be at least five minutes faster. Hopefully, if I just follow my own advice that can be done, the question is will I keep coming back for more? Over the winter I struggled to get up in the mornings for a swim but I did manage to get out on the bike several times for long rides, even on icy roads in January. So the base level was good for my first half-ironman in the Brecon Beacons. I expected a cold swim in a lake but it was a balmy 18 C. The swim went OK except the lake was shallow and two laps meant you got a good mouthful of muddy water! Then onto the bike which was pretty chilly initially. The wind was a bit tough and the large 400m hill towards the end had to be hit hard as thats what I like to do on hills. I overtook a lot of guys but paid for it on the run. My old nemesis cramp got me again with only 12.5 miles out of 13 still to run. So I didn’t do a blistering pace but finished the event in a reasonable position. A week later it was off to Ironman UK 70.3 in Exmoor. It was bleak weather and blowing a hooly. The swim went well and it was onto the bike. I managed to keep up a good pace for the first lap but slowed a bit on the second. So my pacing was out. The course was tough. Very hilly so as I started the run my legs were already quite tired but I set off at a good pace. Then once again as I started to go downhill my right Hamstring cramped again! It was then the usual story of managing cramp which set off every time I went downhill, and there were a lot of hills! So my target had been sub 6 hours. I was still on for that time until the last lap when my legs just seized. I couldn’t even move for a minute. I managed to gradually nurse the legs back and made it home in 6:02. Disappointing. So the main problem for me was cramp. I had 3 months before Ironman Mallorca to work out how to stop it. 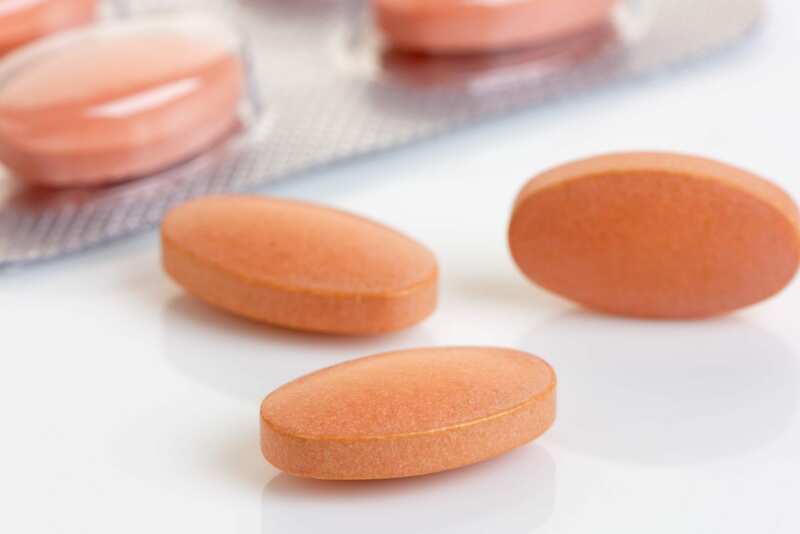 As everyone knows a lack of salt leads to cramp, but how to judge how much to have. Time to bring in some Chiropractic and Nutrition knowledge to banish this demon. Woke up to dry conditions after fitful sleep. Partly due to the awful hotel entertainment keeping me awake. A mistake not to be repeated. The swim was a rolling start so managed to stick with a good pace. No repeat of the previous Mallorca Triathlon this time. I exited the water in 1:06 then remembered to start my Garmin watch! Teething problems again. Transition was relatively smooth and off I went. I was managing to stay ahead of most of the normal bikes but there were some amazing bikes passing which would have helped. Sticking by the rules and not draughting I used my knowledge of the mountain part of the course to good effect but was starting to fatigue towards the end. However this time I was taking the salts on board as well as the home made granola flapjacks. That wasn’t such a good idea. The bag became a big blob of sticky nuts and seeds and eating it slowed me down. I also needed back pockets to keep it in. Not very Aero. So overall an amateurish approach. More lessons learnt. T2 was a slow affair, I didn’t want to forget anything and needed a bit of time. Then it was off on the run in 28 degree heat in the shade. It was hot. I tried to stay in any shade I could find and bouyed on by the support of the crowd who were quite entertaining at times I ran, jogged and then shuffled my way round. There’s a small bridge on the course and by lap 3 and 4 I was walking up and down that. Eventually when you felt you couldn’t take anymore the finish came in sight and I got over the line in 11:40. Not bad and ahead of my target of 12 hours. So I was very pleased and encouraged to keep going. 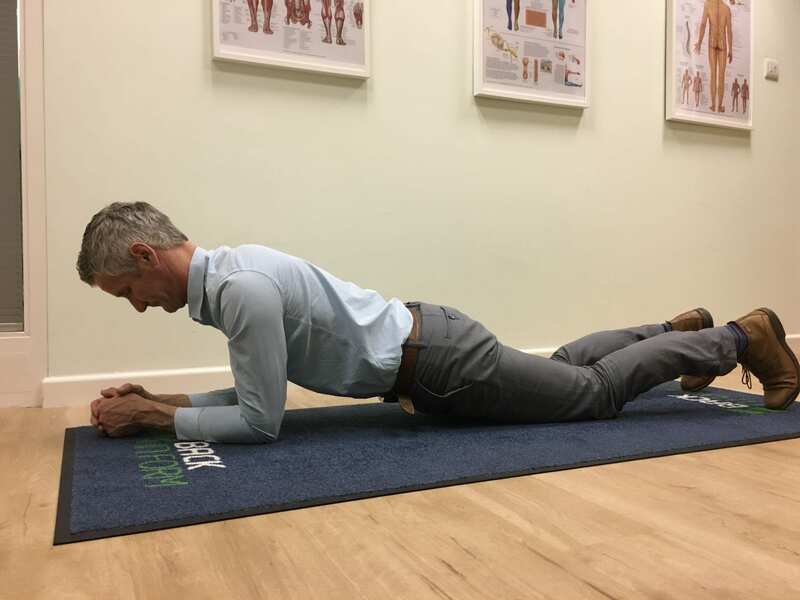 Selection of Core exercises for Low Back pain. 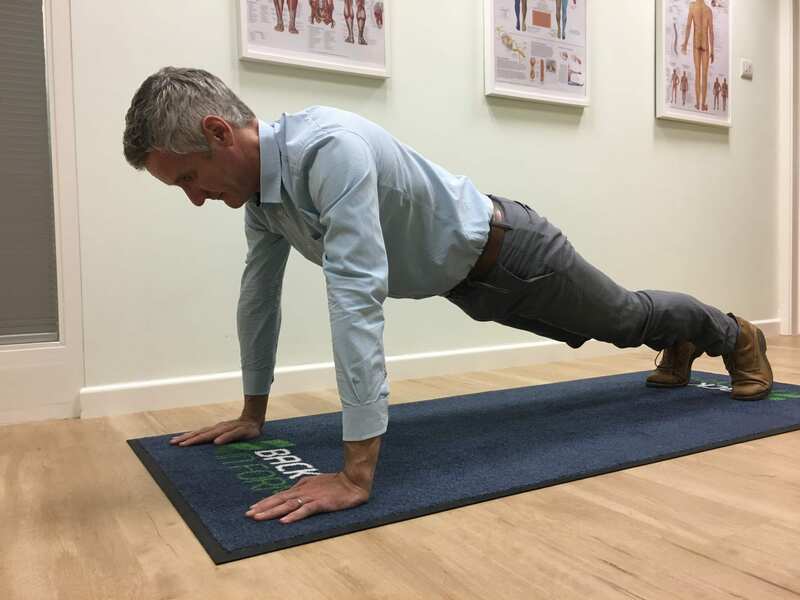 Core exercises have been the buzz word for well over a decade now and there’s good reason for this. They help to stabilise your lumbar spine and keep you free of back pain. To find out more on why go the end of of this post. In the meantime here are some to be getting on with in increasing order of difficulty. 1. Using a wobble cushion or gym ball to sit. This exercise makes you engage your core muscles as you balance on the slightly unstable surface. It is suitable for all ages and abilities if using the cushion. You can progress to the ball (if you have room for one). Word of warning; small children like to bounce them around. Go onto all fours keeping your low back in a neutral position (not arched up or down too much, somewhere in between). 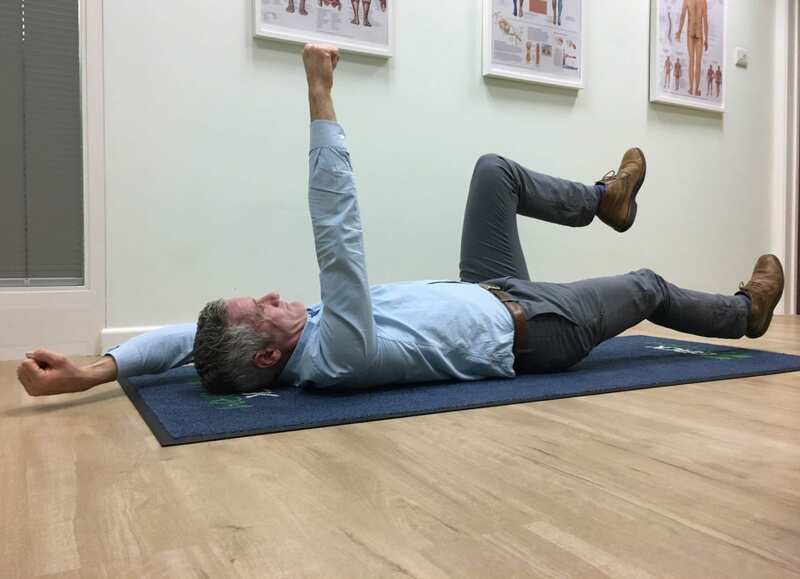 Then very carefully lift your knees slightly off the floor by tensing your lower stomach muscles as shown below. Hold for anywhere between 5-30secs and repeat. The number of reps is up to you but it is best to work until you feel that the muscles are getting tense and a little tired. 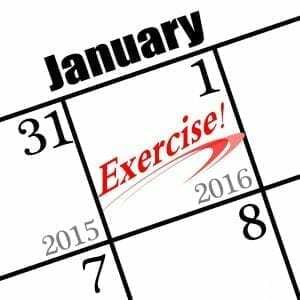 Progress this number steadily to your goal. 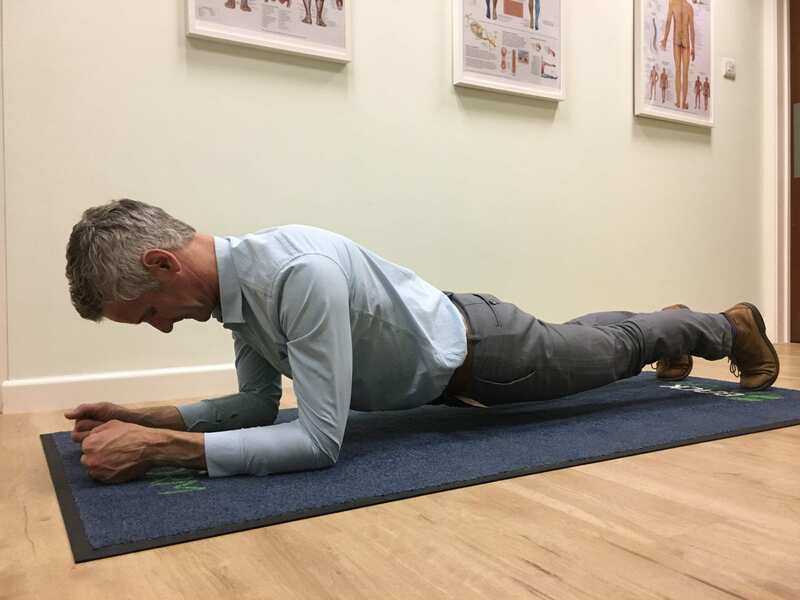 This is basically a plank which is detailed below, but you can either do it on your knees or against a worktop, desk, sofa or bed. The lower you go the harder it is. You can rest on your elbows or straight arms, it’s up to you. The important thing is that it should not be straining your low back. 4. Dead Bug: Lie on your back with your arms and legs above you like a dried out bug! Have your knees bent. Slowly while tensing your stomach muscles lower an arm and opposite leg. Keep control of your core, make sure you keep hips and pelvis level and do not let the lower back arch more. If you feel you can’t stabilise then stop before that point and work the exercise up to there. Over time you will get better at this and be able to go further. Alternate until you feel you’ve done enough. Lie face down on the floor and keeping your body in line push up onto either your straight arms or bent elbows. Keep looking down with your chin held into your neck in a neutral position and your neck elongated. You should feel a slight stretch at the back of the neck. Hold this position for however long you feel comfortable with. You may want to do lots of short holds or go for the endurance one. I would suggest somewhere in between rather than trying to break the world record which at time of writing this, was an incredible 8 hours plus. 5. Plank with alternate leg raises. As above but this time you lift one of your legs off the floor. Make sure you keep your pelvis and hips level. 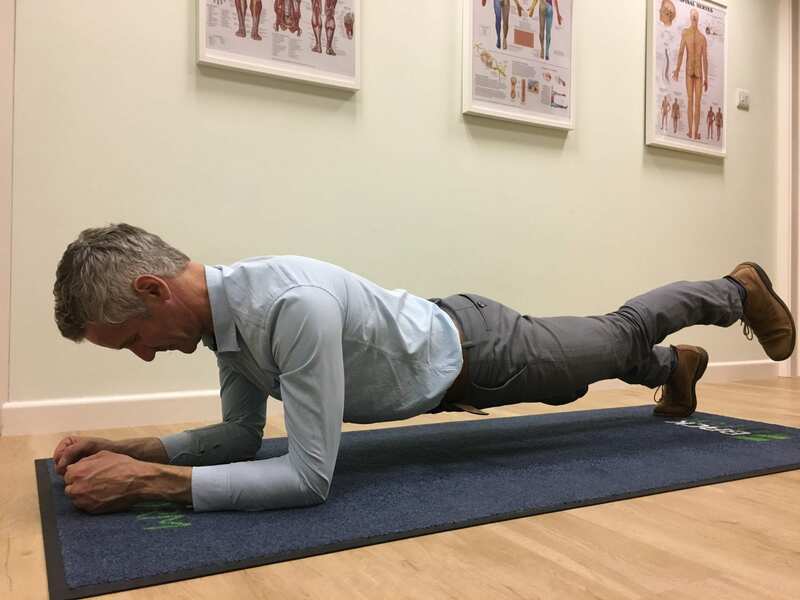 6: Plank on a wobbly surface. Such as a wobble cushion / board or gym ball. These are enough to be getting on with but you can progress to doing standing bodyweight exercises such as squats or weights on a wobbly surface. This is probably only suitable for athletes or show offs. How these core exercises help stability. Imagine trying to bend a barrel… It’s impossible. Now imagine a flexible egg timer. It is inherently weak at it’s narrowest point…easy peasy. Your spine is like this too. In order to have flexibility at the low back and neck you have a column of bones. The pelvis and rib cage are different and go all the way round. So they are a lot less mobile. Take away the muscles form the abdomen and low back and you will have a floppy but tough structure. Add in the back muscles and hip flexors and these act as guys, similar to those supporting a flag pole. That helps stability but it is still vulnerable to big loads. Imagine now placing that pole in wall of a circular large wrapper that tenses and shortens. Now you have stability and the pole won’t move much even with large loads. This is effectively what your abdominal muscles do. They spread forces around the body and help the lumbar supporting muscles to move the spine in a controlled way. The stronger the muscles the longer you can support. 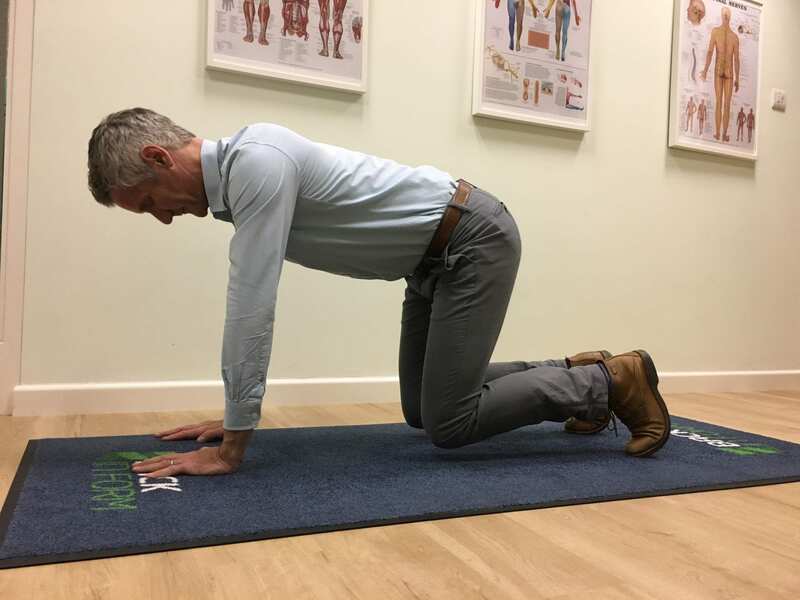 Weak muscles result in increased movement of the low back joints and the increased chances of developing injuries and subsequent arthritis as the spine lays down bony spurs to stabilise itself. 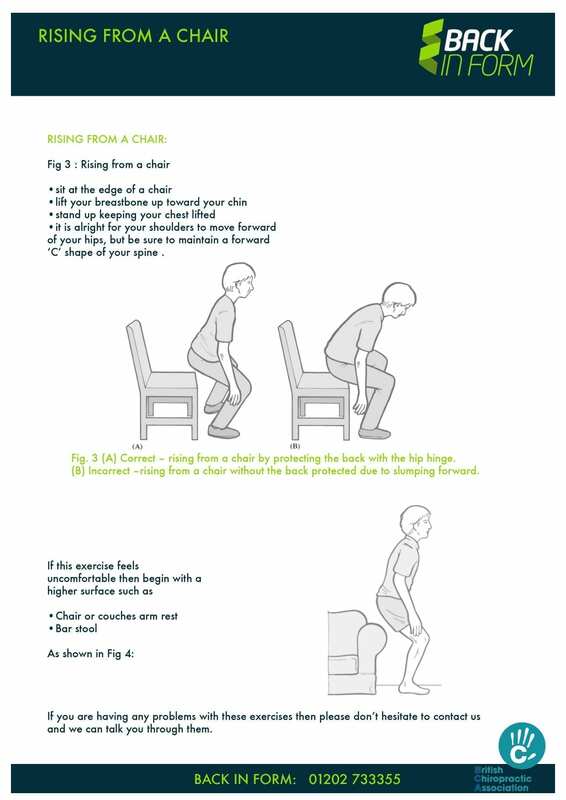 Back Pain Exercise, How To Get Up From A Chair. 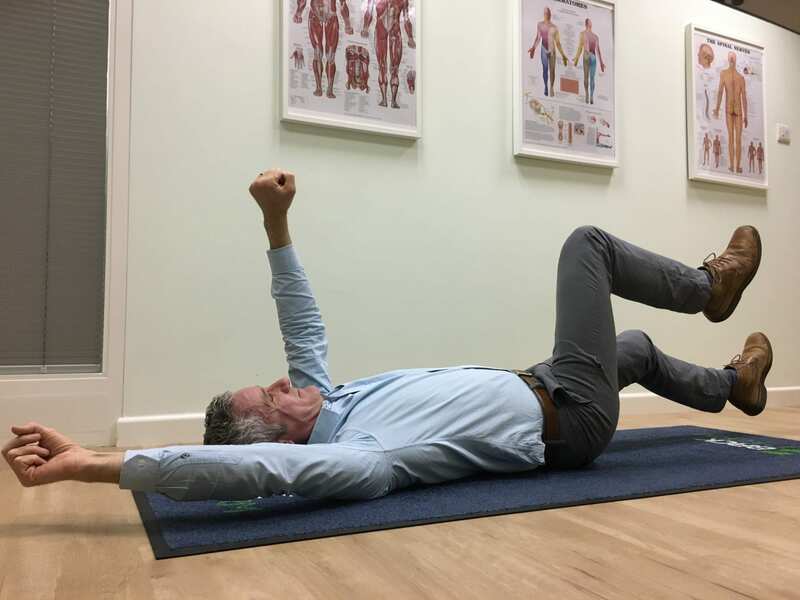 Hip Hinge A Practical Exercise For Helping Back Pain. We all get up and down from chairs regularly through the day. How many of do so with a groan due to back pain? Following this simple back pain exercise will help strengthen your thighs, Buttocks and spine. The end result stable and stronger low back, hips and knees. 4 Exercises to help you get fit for the Slopes. Skiing and boarding involves prolonged periods of hip and knee flexion. This involves working the Gluteal muscles, hip adductors, quads and foot muscles hard to help stabilise and control knee and hip flexion. If you want to be able to ski a whole run and keep doing that all day for a week then you’ll need to start these exercises if you haven’t already. 1. 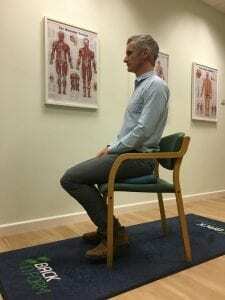 Everyone knows the sitting on a wall exercise but to improve function you need to go a step further and squat with 60 degree knee bend and hold this position without a wall. To protect the knee push the knees out a little. 2. A progression of this is the one leg squat. Make sure you bend fully at the hip and not the back. Your bottom should move backwards rather than the knee moving forwards, your spine should stay locked out. It is fine to touch a wall for balance but move on to free standing if possible. By now you will be getting good hip strength and the muscles at the inside of the thigh will be stabilising the knee well. 3.A variation of this is the running man. Simply squat on one leg and move your arms as if running while staying on one foot. So you are doing repeat squats but stabilising with arm movements as if running. 4. If you want to get into the deep powder or power down the pistes then the next exercise is great for training explosive power. Lateral Bounds will give you the bounce you need to transfer your weight all day long. Simply jump forwards and sideways while springing in big steps. Use your swinging arms to stabilise. You’ll need a lot of room for this one so it’s really best done outside or at a gym with a running track. 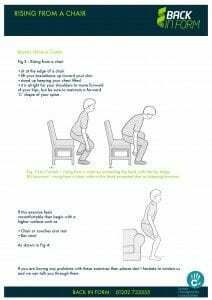 Start on week one with the static squats, on week 2 add the dynamic squats, then week 3 one leg and finally if fit and strong the bounding in week 4. Do every other day to allow time for recovery. Stretch after the exercises.